Today Samsung announced its new Exynos Modem 5100 – what it claims to be the industry’s first multi-mode 5G modem. While over the last few months, and years, we’ve heard a lot of news regarding 5G modems from various vendors, in particular Qualcomm’s new X50 modem – Samsung S.LSI tends to avoid much public PR fanfare until its products are near release. We’ve heard rumours about the new 5G modem being presented earlier this year at MWC but couldn’t get any more details out from Samsung. 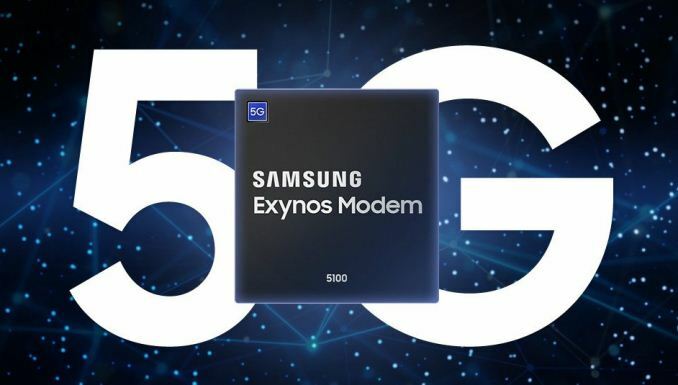 Today’s launch differs in the sense that the Exynos Modem 5100 claims to be the first multi-mode modem solution – meaning the new chipset is a full standalone solution supporting the new 5G sub-6GHz and mmWave as well as all existing standards, including 2G GSM/CDMA, 3G WCDMA, TD-SCDMA, HSPA, and 4G LTE. This comes in contrast with Qualcomm's X50 modem which requires the SoC modem to provide the legacy connectivity option in order to provide platform multi-mode functionality. Where Samsung would have a definite advantage is integration into products that don't implement any connectivity in the first place. In terms of specifications, the new modem supports 8x carrier aggregation in both 5G NR as well as LTE – it promises to achieve LTE category 19 download speeds of up to 1.6Gbps, 5G sub-6GHz speeds of up to 2Gbps and 5G mmWave speeds of up to 6Gbps. For 5G NR this means we’re working with 8x 100MHz channels summing up to 800MHz of bandwidth, versus 8x 20MHz / 160MHz for LTE radios. Uplink bandwidth is implemented with up to 2x carrier aggregation in 5G NR and LTE. For both downlink and uplink, the mmWave connectivity is implemented with 64-QAM versus 256-QAM for the sub-6GHz bands. The new modem comes with accompanying RF IC / radio front-ends, envelope tracker and power management ICs. Samsung implements the Exynos Modem 5100 on a 10LPP manufacturing node – while this might come at a disadvantage to eventual 7nm parts from the competition, Samsung promises commercial availability by the end of 2018, giving Samsung seemingly a lead in terms of time to market if everything pans out as claimed. Actually 5G (and I mean mmWave 5G, since sub-6GHz 5G is as fast as 4G LTE Category 20) is stronger than WiFi only in the sense that the mobile towers provide a stronger signal, i.e. with many more watts. Watt for watt WiFi is stronger, penetrates walls and floors easily (mmWave 5G cannot, so it is ruled out for in-building connections, where it will have to fall back to sub-6GHz mode) and it has a longer range. That's because it uses a lower frequency. Higher frequencies provide faster speeds, but at the trade-off of all the above. mmWave 5G will also require a much higher density of mobile towers/antennas, due to its longer range, so it will be more costly to telcos and take much longer to be deployed, but even when it is deployed, there should be many "dark spots" remaining. "...while this might come at a disadvantage to eventual 7nm parts from the competition, ..."